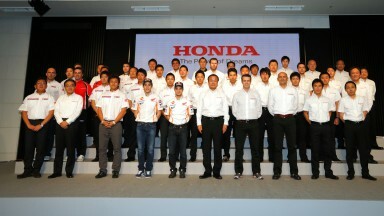 Honda Motor Co., Ltd. announced the key features of its 2013 motorsports program, including its motorsports strategy and initiatives for expanding the popularity of motorsports. Since the days of its founding, Honda has always been involved in motorsports, aiming for the world's top level. Combining motorcycle and automobile racing, Honda currently competes in or provides support to more than 100 race categories around the world. The challenging spirit that symbolises Honda Motorsports has now taken root in every region of the world through these activities. Honda will continue and enhance its involvement in motorsports on a global scale, so that it can ensure growth in ways befitting Honda, meet the expectations of even more customers worldwide, and expand joys. With regards to Motorcycle activities, in MotoGP, the premier class of the FIM Road Racing World Championship Grand Prix, the Repsol Honda Team, a Hon da factory team, will put forward a line-up of two riders. 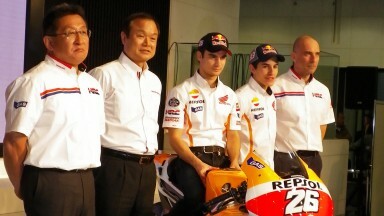 Joining Dani Pedrosa in the team this season will be Marc Marquez, the Moto2 class champion from last season. 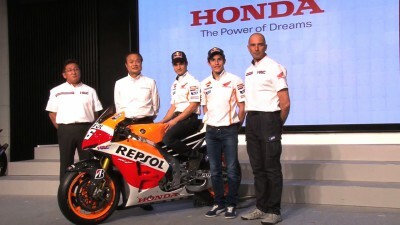 Entering the MotoGP with the RC213V and its enhanced competitive power, Honda is targeting to win all three championship titles this year ― riders, team, and constructors ― and will also supply machines to its satellite teams, for a total of three teams and four riders. The two satellite teams will be GO & FUN Honda Gresini and LCR Honda MotoGP, with riders of Alvaro Bautista and Stefan Bradl respectively. Honda will also continue to provide support to Hiroshi Aoyama (Avintia Blusens), who will enter the CRT class. In the Moto2 class, Honda has been providing active support since 2010 as the sole official engine supplier, supplying an engine that was developed based on the one for the CBR600RR. 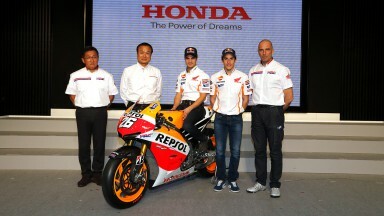 Now Honda has decided to serve as the official engine supplier for three more years until 2015. With the aim of reinvigorating motorcycle racing in the Asia region, Honda will provide support to IDEMITSU Honda Team Asia, a new team joining the Moto2 class this season. The team manager will be Tadayuki Okada. Yuki Takahashi, now in his fourth season as a Moto2 class rider, will compete for this new team. In the Moto3 class, Honda will provide support to Hyuga Watanabe, who scored a podium (with a third place finish) and ranked tenth last year in the Moto3 class of the CEV Spanish Road Racing Championship. Showing fierce battles, this class has turned out many riders for the WGP. Former riders in the CEV Spanish Road Racing Championship include Dani Pedrosa and Marc Marquez, who both now race in the WGP. Press release courtesy of Honda Racing Corporation. Dani Pedrosa: "You can always improve"
Márquez: "I think Jorge, Dani and Valentino are still another level"